RVSiteBuilder is an advanced website builder that integrates with the cPanel™ hosting control panel. It is now available for FREE for most users of the cPanel† hosting control panel. - Create the project, add the company name, web site title, upload logo. - Select the templates, tweak the template styles. - Choose the preferred navigator, create and manage page structure. 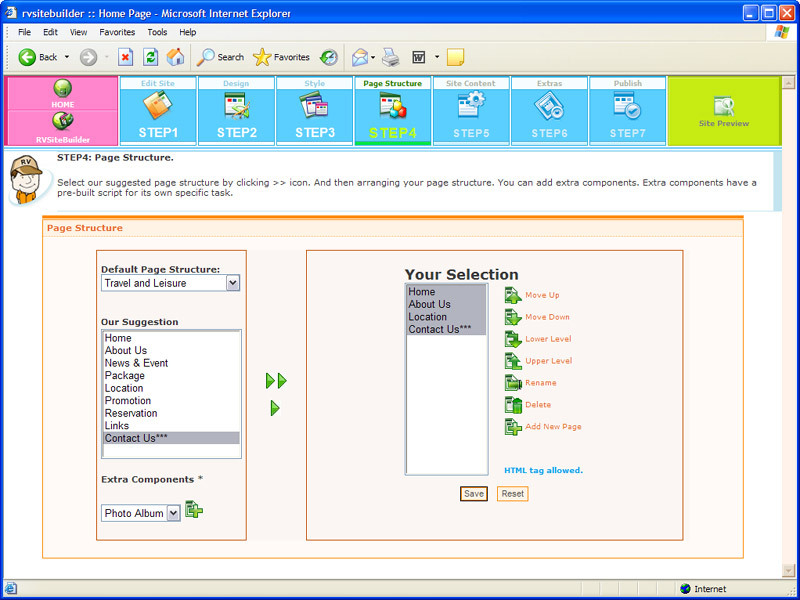 - Edit the pages with WYSIWYG html editor. - Preview and publish the website. We have decided to phase out RV Site builder on our servers, and we have ceased advertising it as a feature. RV Site builder is a third party sitebuilder on our CPanel web hosting plans. We are phasing it out for a number of reasons, but mainly because it hasn't been as reliable as it should be, and it has high support costs. It has also only had very limited uptake, so there are very few websites that use it. There are also now far better CMS options out there now, such as Concrete 5, CMS Made Simple and Wordpress, which are relatively easy to setup, and can have far more features. These weren’t available or as easy to use when we first introduced RV Sitebuilder. These can be setup from inside CPanel using the Softaculous autoinstaller software or downloading them free from the developers websites. You can setup RVSiteBuilder in your hosting account, by clicking on the 'RVSiteBuilder Icon' on the main cPanel page. Please note that you don't need to use RV Site Builder to build your website with, on our network. You can infact use any software you wish, including Adobe Dreamweaver, GoLive etc. Online Site Builders such as RV Site Builder are suitable for simple small brochure type websites, however if you want more control over the design and features of your website, we would recommend hiring a professional website designer, or learn how to do web design yourself. 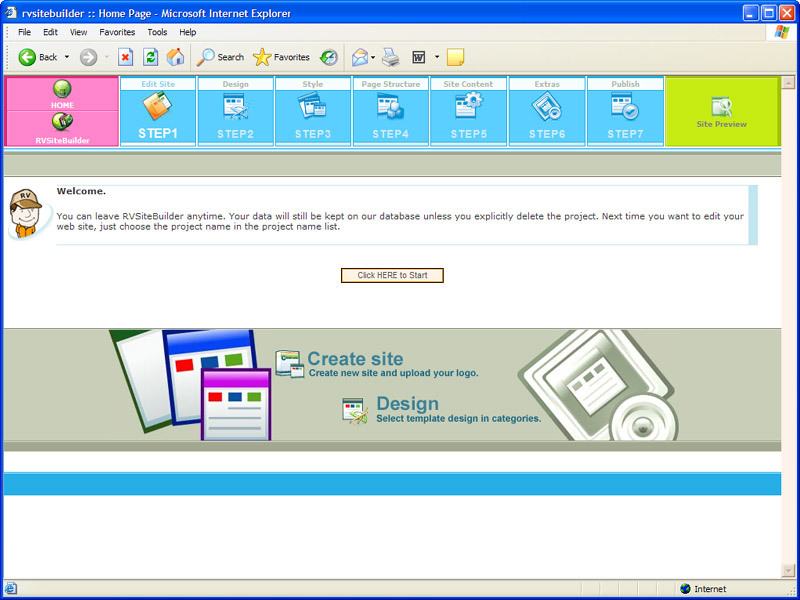 Screen shots showing how just easy it is to setup a simple website with RVSiteBuilder. 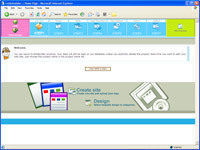 RVSiteBuilder uses WysiwygPro as it's online HTML editor. It supports all Internet Explorer versions from 5.0 up on Windows, and Netscape 7.1, Mozilla 1.4, Firefox 0.9 up or any other browser with an equivalent gecko layout engine on any platform where these browsers are available. This includes Macintosh and Linux. Keep in mind that you don't need a supported browser to see HTML pages generated using WysiwygPro , you just need a supported browser to edit with WysiwygPro. We don't provide any technical support for RVSiteBuilder, as it is third party software that we provide free of charge for most of our cPanel™ users . Nor do we guarantee that it will be bug free or will install correctly for you. Therefore RVSiteBuilder is provided 'AS IS' . As with anything that you store on the server, you must also make sure that you make regular backups of anything that you store or install on the server, so that you have always got the latest version. You can find help on using the RVSiteBuilder software by visiting the FORUMS on the developers website at http://www.rvsitebuilder.com . RVSiteBuilder is avaliable for free, on our cPanel† Web Hosting Plans. RVSiteBuilder is also not available to users on our NZ Based Web Hosting Plans , as it is only available through the cPanel™ Control Panel.